I now have a monthly routine of setting myself targets for my knitting, crochet, and blog. This is the end of the second month and I must say structuring my crafting this way is definitely something I will keep up. At the beginning of February I gave myself 2 tasks to complete, and I am over the moon to say that I have completed these and more! 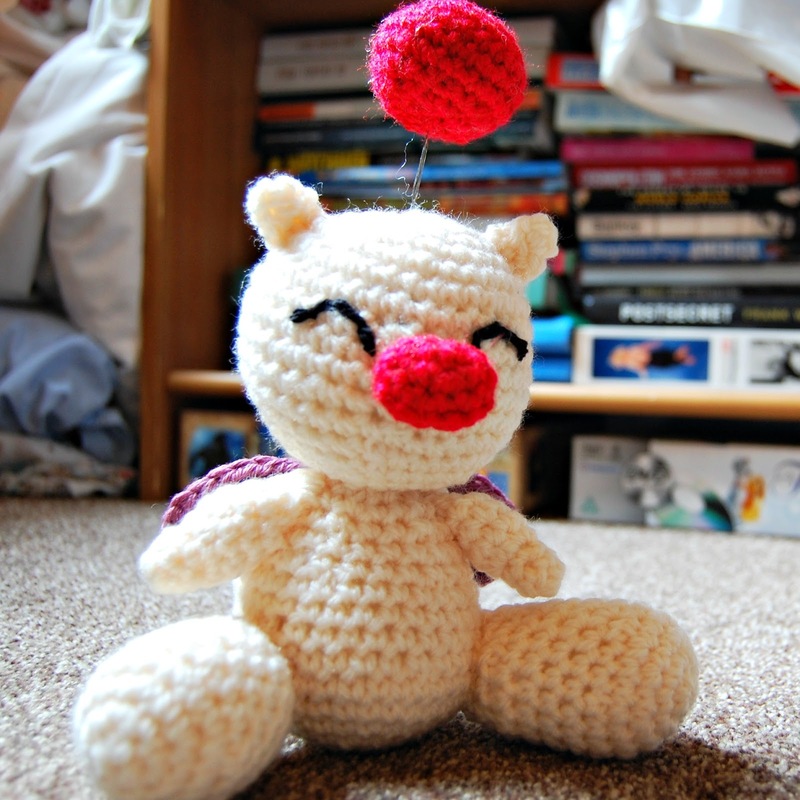 Completed - get that Moogle pattern written! Based on the Christmas decoration I designed in December, I have successfully designed and written a pattern for the full moogle! He is designed after moogles found in the Kingdom Hearts games, but you can find them in every Final Fantasy game out there and I love them as character. They translate so well as amigurumi as well don't you think?. I'm really pleased with how he turned out - better than I could have imagined - and I am excited to share the completed pattern with you next week. I would have done so a few days ago, but having already published two more patterns this month I wanted to save this one for March. 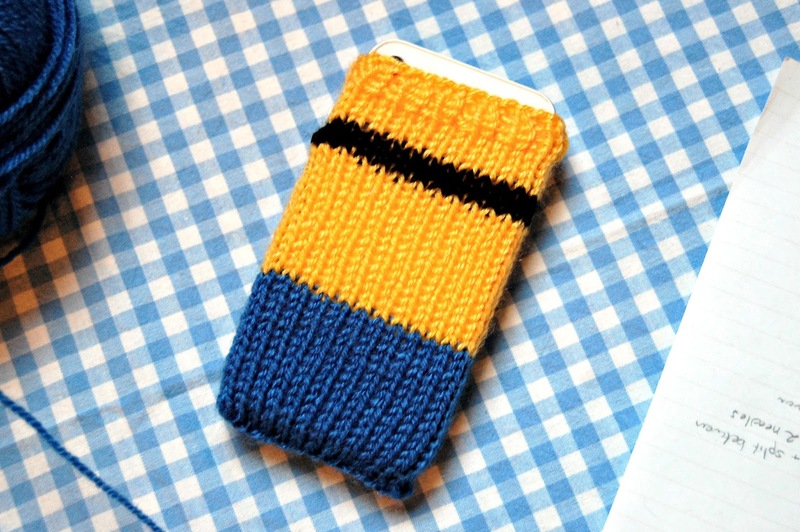 Ever since I made some minion gloves for an order I've had a very distinct idea in my mind of how I would design a knitted phone cover, using the multitude of yarn I had left over. I ended up working out the tension and the main piece of the case during 2 long train journeys early in the month, and had a lot of fun perfecting the eyes and adding a little optional pocket to the minion's dungarees to give it that little extra something. Making something so bright and happy was certainly a highlight for me this month! 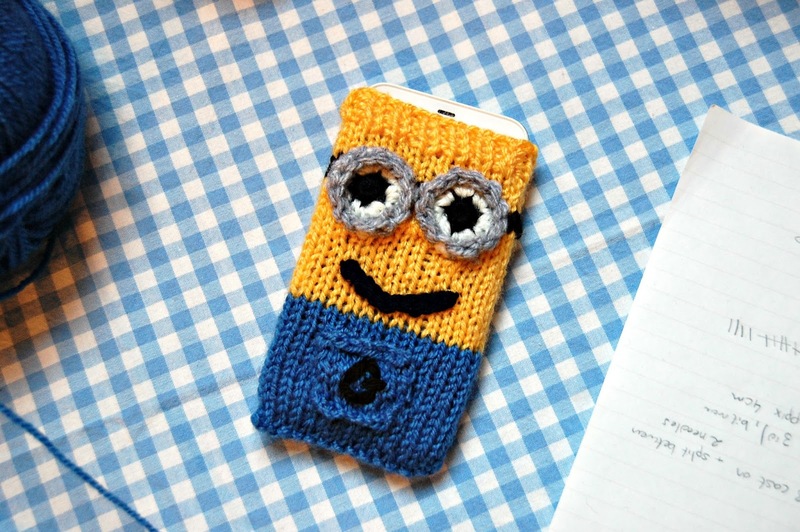 You can find the free knitting pattern for the minion phone cover on my blog, and you can save the Ravelry pattern page in your library for later (please note there are some crocheted elements to this pattern). I also have 2 covers, suitable for an iPhone 4/4s, available to buy in my Etsy store as a result of practising the pattern. This was a bonus accomplishment this month which, to be honest, I had not planned on doing in the slightest! I had designed this pattern and taken many pictures back in May 2014, but not long after my then laptop gave out and I thought I lost all my hard work. So I didn't really fancy looking again. But earlier this month Charlotte asked if I was still planning on sharing this pattern as she was keen to make it, and searching my hard drive revealed I only lost half my work! So using my notes I finally got this pattern up on the blog! Feeling a little smug about getting this one done as well! You can find the free crochet pattern on my blog, and you can save the Ravelry pattern page to your library for later (please note there are sewing elements to this pattern). I also completed my jumper this month, but have decided I'm not that happy with it, so I'm going to unravel it and I cast on a new jumper last night. I feel excited about this though and I definitely seem to have my mojo back this month! I really feel I got lots of good and fun stuff done this month and only hope this carries on! Did you make anything fun/something you're proud of this month? A few days ago I decided that I was going to rip out the jumper that I recently finished knitting as I just wasn't happy with it and I really want to make something that I will love to wear. I've decided not to reknit the pattern (even though I would recommend it) because I want a fresh start and here are some ideas for a new jumper! I spotted this pattern on Pinterest and fell in love immediately! 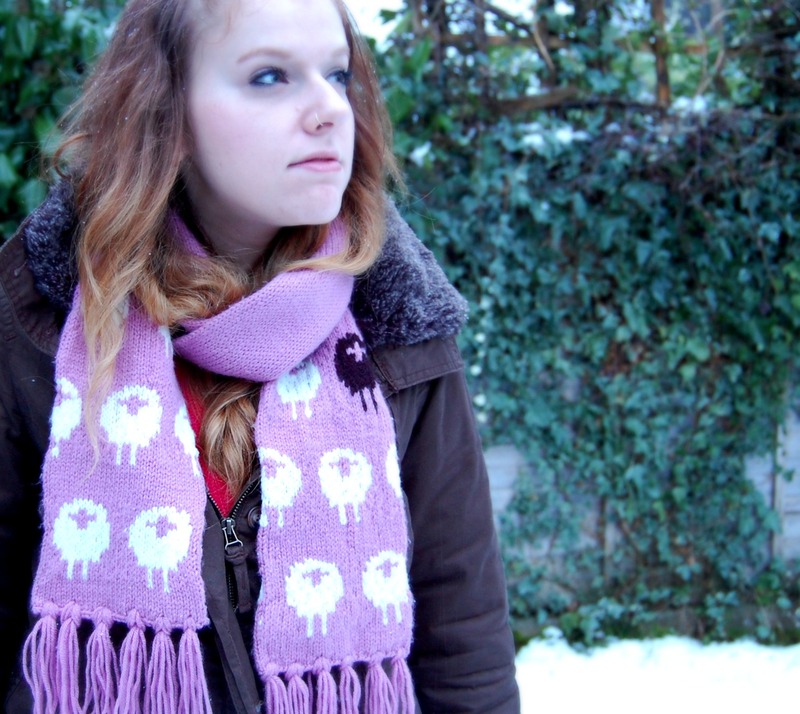 Elise also sent me a message saying she had already knitted it which encourages me even more that I want to make this! However I don't think my gauge will match up with the yarn I will have when I rip the current jumper out and the jumper looks like it will look better as a single colour as opposed to a multicoloured one. So this is in my library as a future knit! I adore the simplicity of this look and the way the yarn works with that. A stockinette stitch jumper will suit my yarn much more than cabling I really think. This pattern unfortunately is knitted to DK yarn and mine is closer to Aran weight. 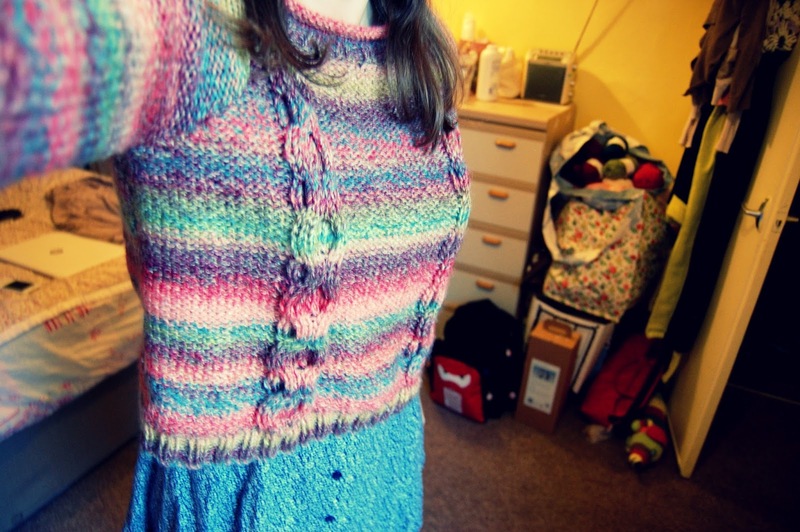 It is also quite fitted and I think I really want to make a slouchy knit jumper which must be easier to make look good? Also I love baggier jumpers - particularly ones you can snuggle and cuddle in to! So I am pretty set on choice number 3! Which is your favourite jumper? This pattern was a long time coming as it was last May that I was working on it to share with you. Basically it took me a long time to find yarn that I was happy with, a while to design the face in a way that didn't look creepy, and then when I did start typing it my old laptop finally gave out after 5 years of service and with all the stress leading up to that point I kinda rage quit ... But thanks to some gently prodding from Charlotte (thank you!) and feeling inspired by the roll I'm on recently blog-wise I would like to finally share a crochet pattern for my Pikachu phone cover! The instructions below are designed to fit an iPhone 4/4s or other similarly sized phone. If you would like to make it larger simply chain more in the beginning (to make wider) and/or crochet more rounds (to make longer). Please note this will NOT protect your phone if dropped from a height! Note ensure you now have your cardboard in the cover to stretch it to the correct proportions and to prevent you from sewing through both sides. We will also be using glue in the next section so be sure to leave the cardboard in throughout! Now for the tricky part - cutting, sticking and sewing the features! Using the light brown felt cut out 2 long ovals with slightly pointed tips (using the picture to the left as a guide). Glue the stripes into position on the back of the phone cover. Once the glue is dry sew into place with whip stitch and matching thread. Cut two small circles from black felt for Pikachu's eyes. Using white embroidery thread sew his pupils as pictured. Cut two small circles from red felt for Pikachu's cheeks. Cut Pikachu's mouth and tongue from the dark red and pink felt using the picture as a guide. Position the face features on the front of the phone cover, using the picture as a guide and leaving a gap for the nose. Glue into position. Once the glue is dry secure the features using the correct colour thread and whip stitch. Finally embroider a small nose for Pikachu using black embroidery thread and the picture at the top of this post as a guide. Et voilà you have finished your Pikachu phone cover! I really hope you have fun making it, and please be sure to share pictures with me here, on the Ravelry project page, or over on Instagram! As promised here is my finished minion phone cover, inspired by the minions of Despicable Me and well timed for the release of The Minion Movie later this year! And with my free pattern you can make your very own for either a small or large smartphone! I have given instructions to knit a phone cover suitable for an iPhone 4/4s or similarly sized phone. You can also knit a larger phone cover suitable for a Sony Xperia Z3 compact or similarly sized phone. The main phone cover piece is knitted in the round which makes a seamless and safe phone cover (but please note this will NOT protect your phone if dropped!) while the eyes and mouth are crocheted. If you can't crochet you can knit circles for the eyes instead, or cut them out of felt, and a knitted i-cord would work just as well for the mouth. Please ensure you read the pattern carefully before you begin! Also if you aren't a knitter but would like to buy the phone cover I have 2 iPhone sized ones available to buy from my Etsy shop - just click here! If you aren't crocheting or knitting your eyes you will also need black, white, and grey felt. Note instructions are giving to knit the smaller iPhone cover. To knit the larger cover please follow instructions given in ( ). Where no ( ) are given the steps are the same for both sizes. 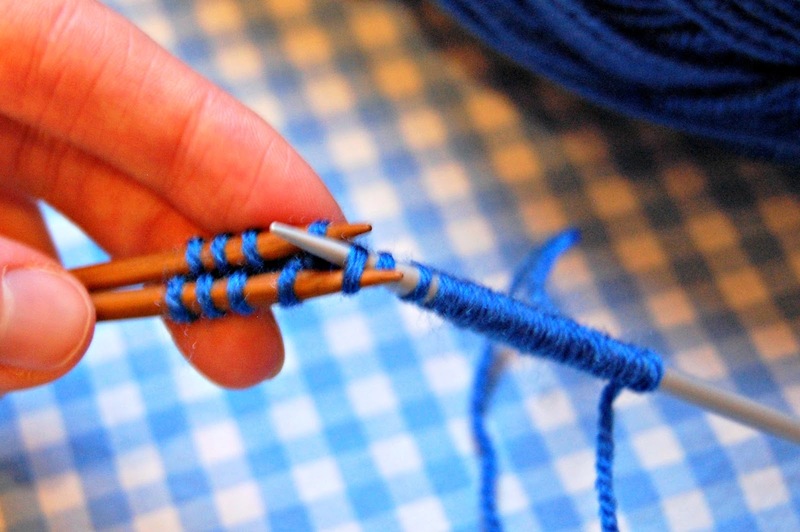 -To create the base slip alternate stitches purl-wise over the other 2 needles. -Check the pictures to the right to make sure you are along the right track! This will create a sealed bottom at the foot of the case. Cast off and sew in loose ends. To finish insert the cardboard cut to the shape of your phone into the phone cover. This will prevent you from sewing the features through both sides of the cover and also stretches the cover to the correct proportions so that you can place the features into place. 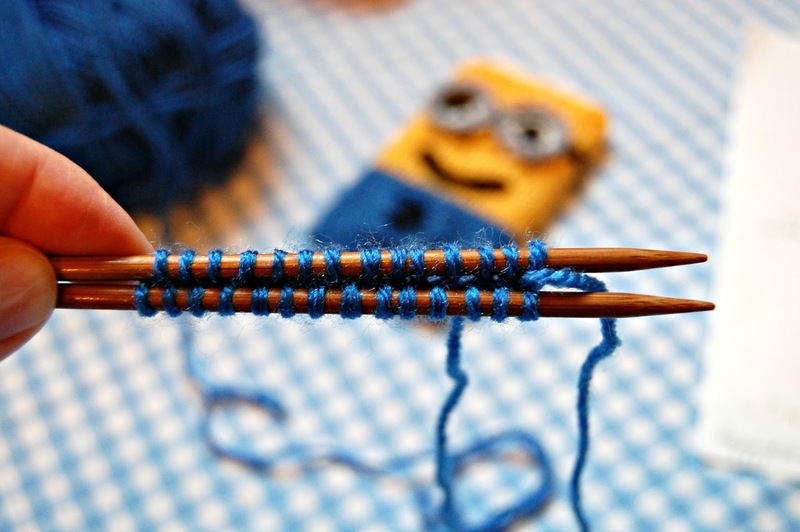 Sew the eyes, mouth, and pocket to the front of the cover using the picture above as a guide. I hope you enjoy your new minion phone cover! 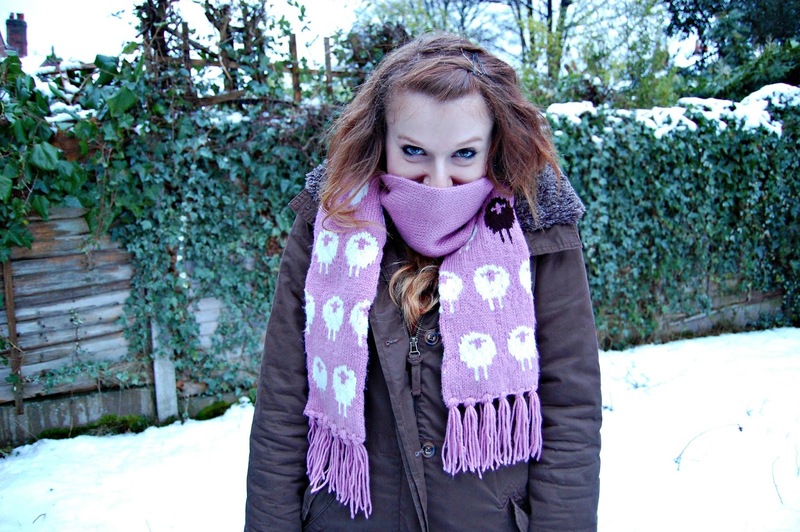 Share pictures with me if you make one here, or over on the Ravelry project page! Do you remember at the beginning of January I set myself the goal of knitting a jumper that would fit? 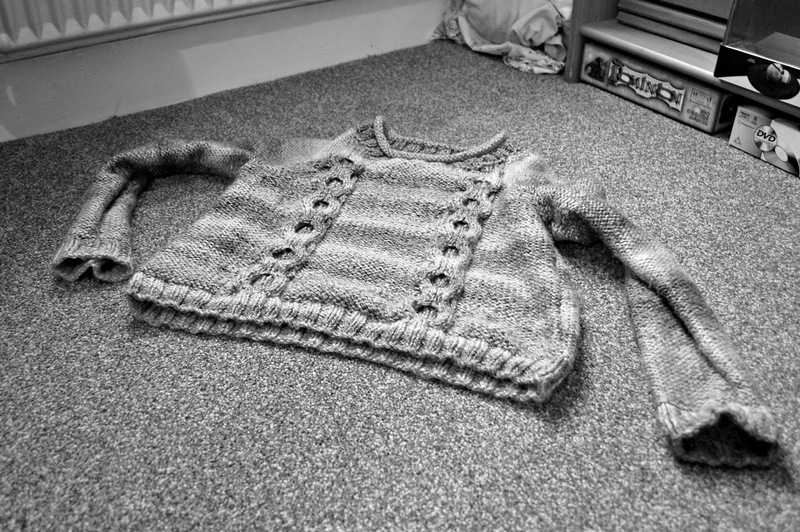 I didn't quite manage this by the time February rolled round, but last week I cast off the jumper and sewed it all up! 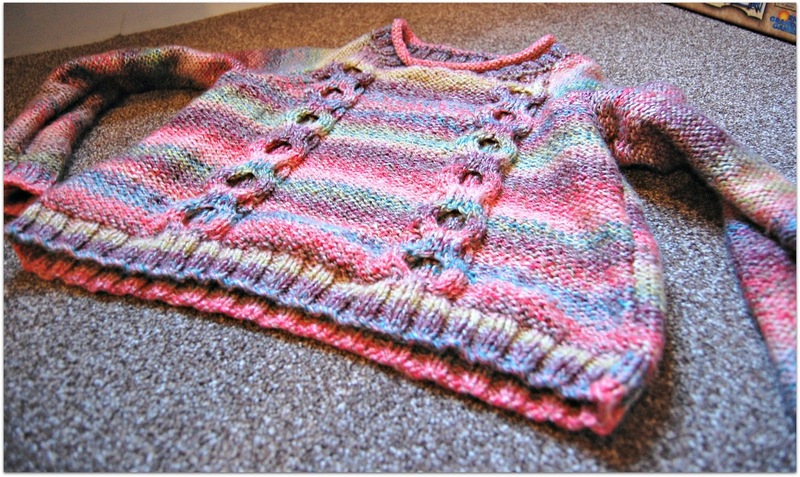 You can also read about this jumper on my Ravelry project page. The pattern recommends 5mm and 6mm needles but when sorting my gauge I needed 5.5mm and 6.5mm as my knitting is very tight. I usually need 0.5mm larger and sometimes I forget this, good thing I checked my gauge thoroughly as I really REALLY wanted this to be the first jumper that fitted me. I was concerened about the sizing though as I am usually a ladies 10-12 if there is a choice and the choices for me were between 8-10 and 10-12. Upon B's grandma's recommendation I chose the smaller size but added an extra stitch at either end of the front and back panels to make sure it wasn't too tight. The good points about this project first! I absolutely adore the colours and the self-striping pattern. James C. Brett yarn is wonderful to work with and I will definitely be purchasing it again. I really like the rolled neckband and after pulling it over my head just a couple of times it relaxed to a very comfortable shape. The pattern was very easy to follow as well, and once I had finished it everyone was very pleased with how it turned out and B even said it was the best thing I'd knitted yet. And now for the niggly parts of this project. My main problem with the finished jumper is the length. It isn't long enough for a regular jumper and it might have just got away with being a 3/4 length pull over but it is a tad too long for that. So with trousers, dresses, skirts and shorts it doesn't quite sit/look right on me. 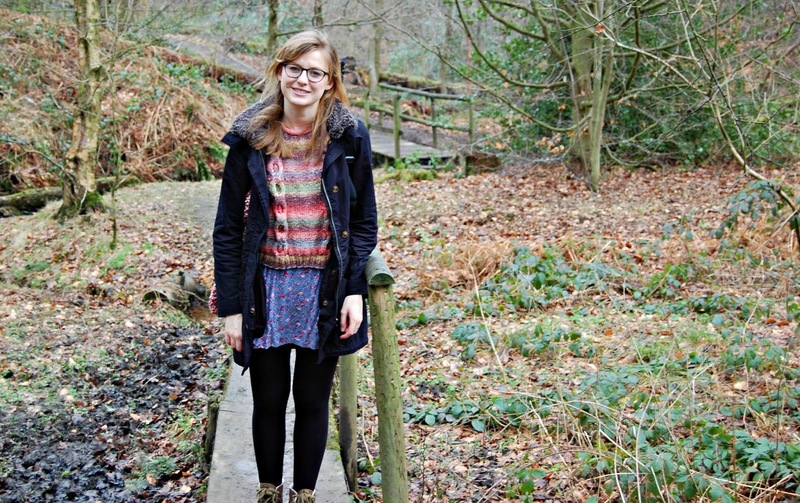 I just about got away with it in the picture of me in the forest but I was very self concious wearing it. I just kept trying to pull it down. The sleeve length is too short as well. Perhaps this is down to me as a knitter but I'm so certain that I followed the pattern and lengths suggested down to a tee. With more experience under my belt I might be able to identify when things are too short before they are finished, but I'm not at this stage yet and I'm quite disheartened. And I need to have more confidence in the patten sizes as the extra stitches were unnecessary and also affected the fit of the jumper in a negative way. When I finished it my dad, my sister, her friends, and B were all very impressed with it and said the length wasn't an issue. I myself was also hopeful that I would get over the issues I have with it and learn to love it. When I shared the pattern for the knitted owl hat a lot of people commented on how nice the scarf that my sister was wearing was in all of the pictures. This is actually what I knitted for her for Christmas 2014 and true to me trying to improve how I used Ravelry and for sharing for fastened off posts on the blog here are some more pictures and notes on the stranded sheep scarf! 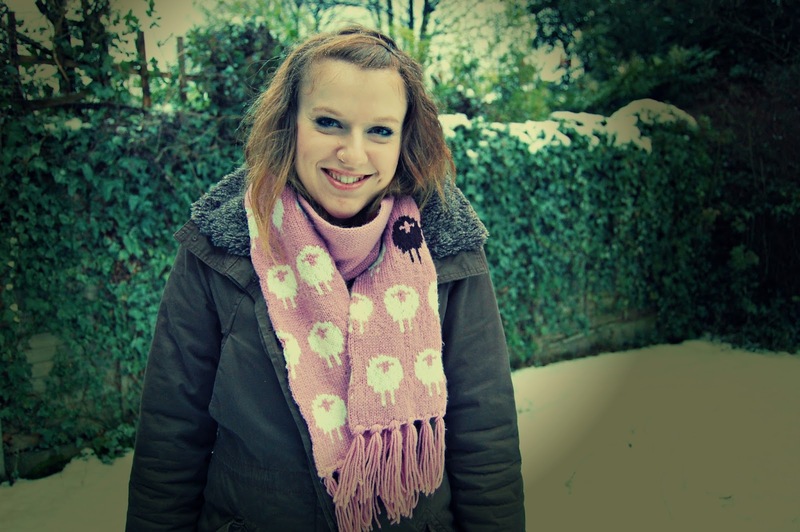 You can also read about this scarf on my Ravelry project page. I cast this scarf on way back in September fully intending to knit the whole length of the scarf with the stranded sheep chart as opposed to simply the ends of the scarf as you can see in the pictures. As this was to be a Christmas gift I felt pretty smug with myself thinking I had given myself such a head start! The pattern is written in the round (stockinette stitch, so in the round ensures both sides of the scarf match) and calls for double pointed needles and at the time I didn't know how to knit with circulars, so I ordered some dpn's and got to work. As someone who is, at the best, an advanced beginner when it comes to stranded (fair isle) knitting it was a nightmare working this scarf over 5 very short needles! As a result I didn't really enjoy knitting the scarf and after a month or so it was clear that with the speed I was knitting this I wouldn't be able to knit the sheep the full finished length of the scarf (roughly 150-160cm). 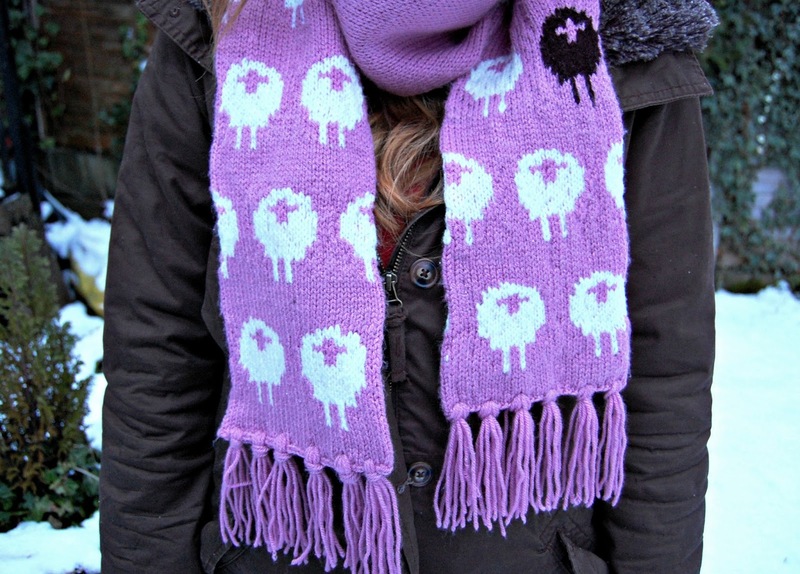 My sister saw my distress and said it would be fine if only the ends of the scarf had sheep - phew! And so I decided to just knit the chart twice at each end (of course upside down at the opposite end so that when worn all the sheep were facing the same way). The original pattern also featured 2 black sheep worked within, but after having only just become used to working with 2 colours in the round on circular needles (I learnt a lot of new techniques making this) introducing a 3rd colour was the most stressful knitting experience of my life! So another change was made and I just stuck to one black sheep. But that worked out quite nicely given its relation to the age-old saying - though I hope you will agree the black sheep is quite striking and special and stands out in a lovely way and not as an outcast!! Once I had finished knitting the scarf (Christmas present, finished at 9.30 on Christmas morning I don't mind telling you! Not including blocking and tassel adding) I was really unhappy with how it looked, with all the colour work bunching up my careful knitting. However the absolute wonders of blocking relaxed the knitting and brought it all together so well I'm so relieved at how it turned out! I can't express how much I love blocking knitting - and I've written a tutorial on how you can block your knitting too! After blocking I sewed up the ends and added the tassels to finish the scarf just as you see. I used this tutorial to add the tassels (but you can ignore the crocheted end step if like me you have already sewn up your scarf ends). And voila! At 9.55am on Christmas day I wrapped this bad boy up to be opened just a few hours later. I am NOT in a hurry to knit another fair isle scarf like this - it took a very long time and could get very repetitive, but I am very pleased with how it turned out and K seems happy enough to wear it out and about :) What do you think? Have you made anything that took a long time, you are proud of, but vowed never to attempt again? At the start of last month I set myself some 'crafty plans' and following the round up of these that I shared yesterday I'm going to set myself just 2 tasks for February. Seeing that this is a shorter month and it (hopefully) appears that I am now receiving more regular orders on my Etsy shop I need to think about any unaccounted-for projects that I may undertake (perhaps reconsidering taking commissions so that I can focus on pattern writing, but its such a pleasure to know that people want to buy my products!) and also the fact that I am treating myself to more reading/playstation time - because, very occasionally, even I need a break from knitting! Get that Moogle pattern written! I really desperately do want to write a pattern for a full amigurumi Moogle modelled on the Christmas decoration I designed in December. This would be my first complicated crochet pattern and I'm excited to see how it will turn out - though it is of course by no means my first. You can crochet my amigurumi Spiderman doll using the free Ravelry download pattern by following the link - and a couple of other patterns over on my patterns page! The popularity of my Totoro phone cover and the fun that I always have when I make it has convinced me that I really should design some more phone covers, and a minion one would look amazing! 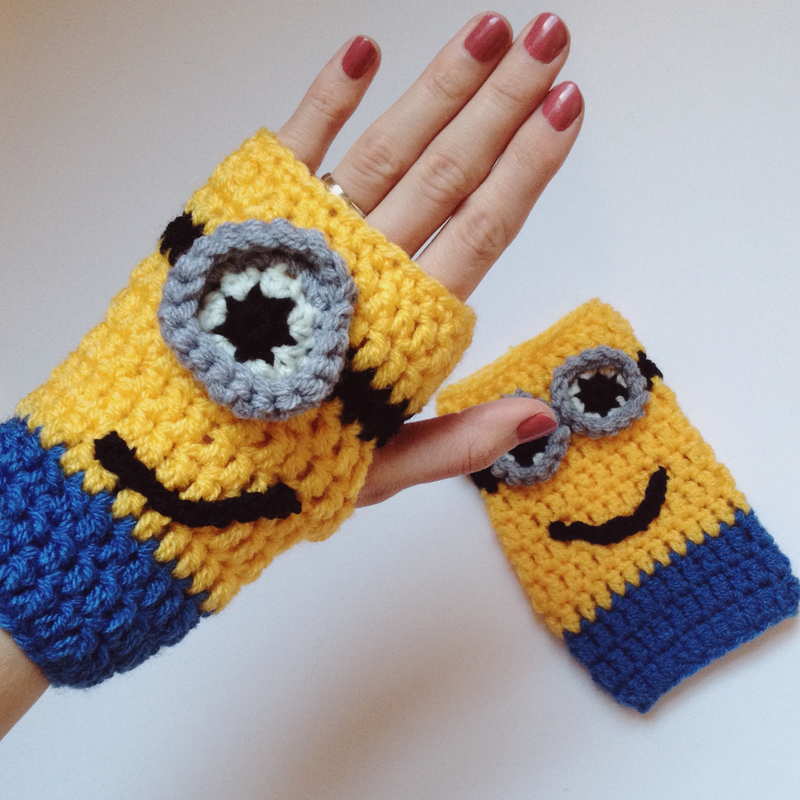 I have loads of yarn left over from the two pairs of crochet minion mittens that I made for orders before Christmas that are the perfect colour for minions. 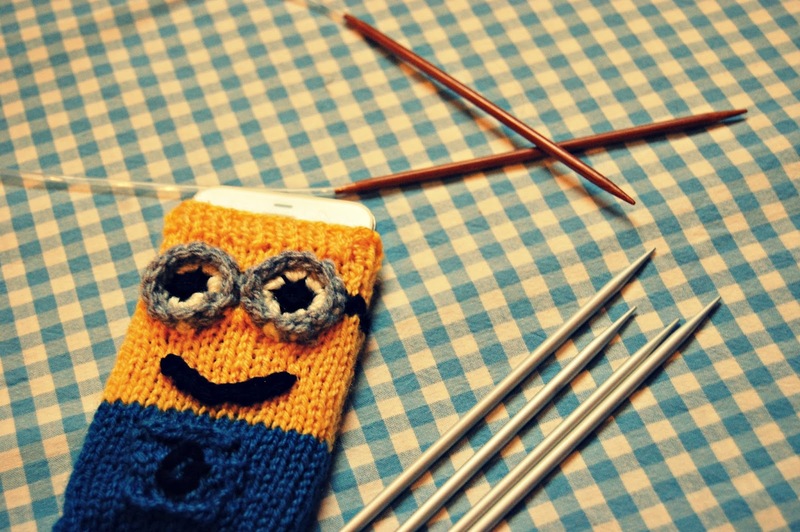 I have this vision in my mind of how a knitted minion phone cover will look and I really want to get this on the needles to I can perfect it and also write some more knitting patterns. I want to get these two patterns written this month alongside finishing my jumper and potentially starting a cradigan as well, but these are much larger projects that I should do in my own time and mustn't rush! 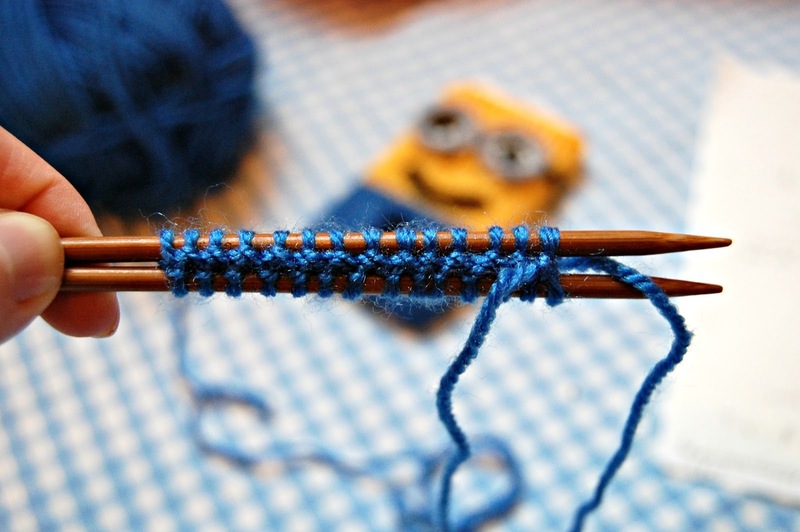 What are you going to knit/crochet this month?